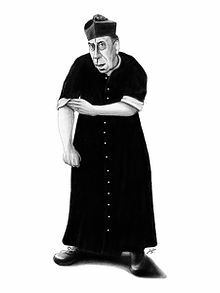 Giovannino Oliviero Giuseppe Guareschi (Italian: [dʒovanˈniːno ɡwaˈreski]; 1 May 1908 – 22 July 1968) was an Italian journalist, cartoonist and humorist whose most famous creation is the priest Don Camillo. Giovannino Guareschi was born in Fontanelle di Roccabianca in the Province of Parma in 1908. He hailed from a middle-class family. Guareschi always joked about the fact that he, a large man, was baptized Giovannino, a name meaning “little John” or “Johnny”. In 1926 his family went bankrupt, and he could not continue his studies at the University of Parma. After working at various minor jobs, he started to write for a local newspaper, the Gazzetta di Parma. In 1929 he became editor of the satirical magazine Corriere Emiliano, and from 1936 to 1943 he was the chief editor of a similar magazine called Bertoldo. In 1943 he was drafted into the army, which apparently helped him to avoid trouble with the fascist authorities. He ended up as an artillery officer. When Italy signed the armistice with Allied powers in 1943, he was arrested as Italian military internee and imprisoned in camps in German-occupied Poland including Stalag X-B near Sandbostel for almost two years alongside other Italian soldiers. He later wrote about this time in Diario Clandestino (My Secret Diary). After the war, Guareschi returned to Italy and founded a monarchist weekly satirical magazine, Candido in 1945. After Italy became a republic, he began to support Democrazia Cristiana. He criticized and satirized the Communists in his magazine, famously drawing a Communist as a man with an extra nostril, and coining a slogan that became very popular: “Inside the voting booth God can see you, Stalin can’t”. When the Communists were soundly defeated in the 1948 Italian elections, Guareschi did not put his pen down but criticized Democrazia Cristiana as well. In 1950, Candido published a satirical cartoon by Carlo Manzoni poking fun at Luigi Einaudi, President of the Republic. The President is at the Quirinal Palace, surrounded by, instead of the presidential guard of honour (the corazzieri), by giant bottles of Nebbiolo wine, which Einaudi actually produced in his land in Dogliani. Each bottle was labeled with the institutional logo. The cartoon was judged in Contempt of the President by a court of the time. Guareschi, as the director of the magazine, was held responsible and sentenced. In 1954 Guareschi was charged with libel after he had published two facsimile wartime letters from resistance leader and former Prime Minister Alcide De Gasperi requesting the Allies to bomb the outskirts of Rome in order to demoralize German collaborators. The legitimacy of the letters was never established by the court, but after a two-month trial it found in favour of De Gasperi. Guareschi declined to appeal the verdict and spent 409 days in Parma’s San Francesco jail, and another six months on probation at his home. His most famous comic creations are the books of short stories he wrote about the rivalry between Don Camillo, a stalwart Italian priest, and the equally hot-headed Peppone, the communist mayor of a village in the “Little World” of a Po River Valley town. These stories have many times been made into films, and television and radio programs; most notably in the series of films featuring Fernandel as Don Camillo. By 1956 his health had deteriorated and he began to spend time in Switzerland for health reasons. In 1957 he retired from the post of editor of Candido but remained a contributor. He died in 1968 in Cervia from a heart attack.